A New Bretton Woods, to Prevent Future Crises? 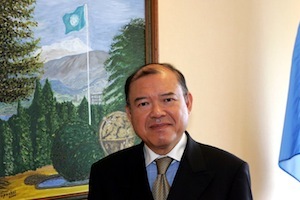 In this column, Supachai Panitchpakdi, secretary-general of the United Nations Conference on Trade and Development (UNCTAD), writes that urgent measures are needed to restore stable and sustained growth, and mechanisms must be put in place to ensure that a financial crisis similar to the 2007-2008 crash never recurs. Much bolder reforms will be required, including perhaps the creation of a set of rules for international monetary and financial relations, similar to those currently governing the use of trade policy measures in the World Trade Organisation (WTO). GENEVA, Jul 9 2013 (IPS) - Almost five years have passed since the global financial crisis, and the world economy is still reeling from its consequences. The main reason for this is the continued stagnation in developed countries, which is adversely affecting economic dynamism in other regions. Indeed, growth in the advanced economies is likely to slow down from 1.2 percent in 2012 to only 0.8 percent in 2013. If developed countries remain unable to revive their economies, there is a risk that this mediocre pace of growth may yet turn into a global recession. At this juncture, we therefore face a dual challenge: first, we must urgently take measures to restore stable and sustained growth in the world economy, so as to truly overcome the crisis. Second, and perhaps even more importantly, we must ensure that such a devastating financial crisis cannot recur. This will require making significant reforms to global economic governance, far beyond what has been achieved so far. Slow growth in the advanced economies and thus in the world economy is partly the natural consequence of a credit crunch and sharply reduced demand in the aftermath of a crisis. However, in many countries, these effects are being exacerbated by severe austerity policies. Despite years of unprecedented monetary expansions in the United States, Europe and, more recently, Japan, banking credit provided to the private sector has stagnated, or even decreased. The problem is not the supply of money, but aggregate demand. Desperately needed are measures to support demand. And yet, austerity policies are contracting demand by raising taxes and reducing expenditure, just when such expenditure would be most required. In this way, several countries that have adopted austerity policies have now been pushed into a double-dip recession. In addition, since these austerity programmes hamper growth – and, consequently, public revenues – they do not achieve their target of fiscal consolidation either. It is therefore time to reassess the merits of the current policy approach. The second key challenge is to prevent a recurrence of the crisis. The financial meltdown at the heart of the financial system has reminded us of a lesson we should already have learnt after the Asian Financial crisis (1997-1998), namely that deregulated financial markets do not allocate resources efficiently and are prone to herd-behaviour and crises. Are Developing Countries Waving or Drowning? Nevertheless, after the initial flurry of measures to bail out banks and companies in need of liquidity, enthusiasm to address the wider systemic origins of the crisis quickly faded. At the national level, there have been efforts to strengthen regulation of the financial sector in the U.S. But at the global level, reforms have been limited to a slight revision of the Basel Capital Adequacy accord, as well as a number of measures to address tax havens. It is not clear whether these measures could have prevented the financial crisis, had they been in place in 2007. And yet, even these minor steps are beginning to be rolled back. More importantly, the reforms have not addressed the more fundamental problems of our global financial architecture. The current system based on deregulated capital markets and floating exchange rates has not prevented prolonged misalignments of exchange rates, or the build-up of large current account imbalances. It has also failed to avert the disorderly expansion of short-term capital movements, which are a major factor of economic instability. In order to address these issues, much bolder reforms will be required. The United Nations Conference on Trade and Development (UNCTAD) has long argued that international monetary and financial relations should be governed by rules similar to those currently governing the use of trade policy measures in the World Trade Organisation (World Trade Organisation). In a world where tariffs and international trade are increasingly governed by a set of rules to prevent “beggar-thy-neighbour” policies and foster trade liberalisation, it is incomprehensible that similar rules do not exist for the global financial system. And this is despite the fact that even small realignments of exchange rates can wipe out any gains from trade liberalisation, or that exchange rate crises have repeatedly shown themselves to have devastating effects. A multilateral system of rules could ensure that exchange rates better reflect long-run fundamentals, and credibly prevent the build-up of imbalances. Similarly, there is a need to rein in the large volumes of speculative capital flows. Such unregulated capital flows generate a risk not only in the recipient country, but also in the source economy, where the solvency of banks may be undermined by their exposure to asset bubbles in foreign countries. Financial supervision should therefore be applied at both ends of capital movements. Already, the International Monetary Fund (IMF) has recently changed its position on the use of capital controls under certain circumstances. However, a multilateral arrangement (such as the “Tobin tax”) would probably be more effective. It is clear that truly preventing future financial crisis will require an overhaul of the current system tantamount to a new Bretton Woods. Any such system must, of course, give greater voice to developing nations than they have so far enjoyed in the international financial institutions.